After six months of hard work, the AGNCY team and their Crowdsourcing, the Labor Collection Violence Collection Service, has recently been declared the winner of the 5th Annual Telenor Youth Forum held in Bangkok. The UN-Sustainable Development Goal, built around # 10, will serve as a digital alert for workers in glass bottles. Telenor Youth Forum's 2017-2018 program ended 31 May at the Detroq Headquarters in Bangkok. 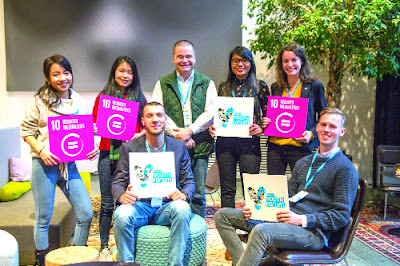 At this event, 24 young leaders of 12 countries presented their 4 new services to Nobel Peace Center Executive Director, Live Torres and Telenor Group's Chief Corporate Affairs Officer Owenche Aegup, among others. Speaking on this occasion, CEO of Grameenphone Michael Foly said, "This service will be very useful in Bangladesh because there is a lack of proper supervision to avoid many acts of violation of labor rights. Grameenphone is always auspicious for labor rights and environmental protection law, and if we take the fullest pleasure of this service, then it will play a big role in ensuring labor rights in the country. In December 2010, Telenor Youth Forum started the Oslo Nobel Peace Prize. Here, 24 representatives are divided into 4 groups, each group is asked to solve a social problem. Since then, the groups were busy creating their ideas, research at customer level and creating prototypes of their services, which ended in Bangkok. Telenor Group's Chief Corporate Affairs officer Owenche Aegup said, "We have pledged to meet the standards of Telen's global position, our standards and the skills of our staff, in the way of equality." Providing technology to talented young people can also help in reducing inequality. I believe in the possibility of AGNCY and are looking forward to seeing how they are in the future. Telenor Youth Forum is a global platform that leads to the idea of dealing with talented youth in reducing inequality. In collaboration with Nobel Peace Center, this forum brings together young leaders / leaders around the world to create a digital solution for empowerment of society. Please do not try to spamming. GRAMEENPHONE 01711 SERIES PHONE IS FREE NOW . ITInfoWorld.org: Glass Bottle Digital Message! Loaded All Posts Not found any posts VIEW ALL Readmore Reply Cancel reply Delete By Home PAGES POSTS View All We recommended for you more: Category ARCHIVE Your Search ALL POSTS Sorry! your search did not match any article or documents.